Over 45 years and 20,000 unique parts later, our customers continue to count on us to design and deliver short run metal stamping. Without a doubt, you should too. Our company started off as a small group of visionary engineers and toolmakers who found a niche producing parts for appliance manufacturers. Since its inception in 1970, Neway sought to constantly improve processes and designs. This drive enabled us to expand into broader metal stamping solutions, including valve components, fittings, off-highway equipment and much more. 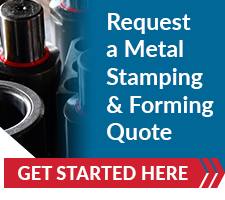 Today, Neway services more than 200 customers worldwide providing a vast array of metal stamping solutions. Our production facility is comprised of more than 56,000 square feet of manufacturing space, a dedicated tool room and quality control facilities. Our team includes seasoned leaders, professional engineers and designers, skilled tool-and-die makers and support personnel. We continually invest in efficient technologies and new capabilities and are proud to be a global niche supplier of short and medium run metal stampings. Customers from many industries depend on us to deliver high-quality work – on time and at a competitive price. The experienced team at Neway is ready to help.